Endoprosthetic replacement of segmental skeletal defects is the preferred technique of reconstruction after resection of bone sarcomas. Today, all of the major anatomic joints with their adjacent segmental bone can be reconstructed safely and reliably with a modular endoprosthetic replacement. Prosthetic reconstruction is routinely performed for the proximal femur, distal femur, total femur, proximal tibia, proximal humerus, and scapula. Allografts are rarely used. A major advantage of a modular endoprosthetic system is intraoperative flexibility; it enables the surgeon to reconstruct defects of any size with minimal preoperative planning. Instead of performing a resection to match a prosthesis customized on the basis of imaging studies that are 4–8 weeks old, the surgeon can concentrate on performing the best possible resection indicated for the patient at the time of surgery. Overall survival analysis of large segmental replacements is approximately 90% at 10 years (reported at 98% for the proximal humerus and 90% for the distal femur). 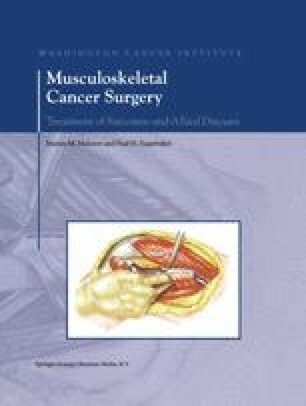 This chapter reviews the indications and techniques for performing endoprosthetic replacements for bone tumors. Many of the described surgical techniques were developed by the senior author, placing emphasis on techniques for reconstructing the soft tissues after implantation of a modular endoprosthesis to optimize the functional outcome.